Mountain High - Ski/Snowboard Rest Of This Season And All Of Next For As Little As $299! Ski/Snowboard Rest Of This Season And All Of Next For As Little As $299! Mountain High, Southern California’s closest winter resort, just released its spring season pass offer which is sure to have you dancing in your boots. Beginning Thursday, March 1st, skiers and snowboarders can get an adult Anytime Season Pass good for the remainder of this season and all of next for just $349. That’s a savings of 50% over a traditional single-year pass. In addition, anyone who has held a season pass within the last three years saves an extra $50, bringing the price down to an amazing $299. 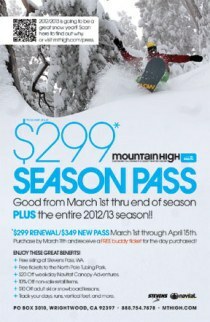 This $299 offer is also available to 2011/2012 season pass holders from ANY other California Winter Resort. Current season pass must be shown when purchasing. Mountain High’s Anytime Season Pass is good any day or night the resort is open with no restrictions. Benefits include FREE skiing at Stevens Pass, WA, FREE tubing at the North Pole Tubing Park, $20 Off Midweek Zipline Tours at the Wrightwood NAVITAT Center, $10 Off Adult Ski/Snowboard Lessons, 10% Off non-sale retail apparel, and the ability to TRACK your days ridden, runs per day, and vertical feet on Mountain High’s new App for iPhone and Android. Children’s Passes for ages 7 to 12 are available as well for just $129 with the purchase of an adult season pass and $179 without. (Regularly $229) Children six and under ski FREE when accompanied by a paying adult. Big snow years tend to follow light ones, so if recent reports hold true, Mountain High is in for a whopper next winter. Mountain High’s Spring Season Pass offer is available March 1st to April 15th, 2012. At $349 or less it is the best deal of any major resort in Southern California. Shop around and compare for yourself. Guests are encouraged to purchase their passes online at mthigh.com; however, passes can also be purchased at the resort and by phone at 888 754 7878. Please note there is a $10 processing for all new passes purchased. Mountain High is Southern California’s closest winter resort located just an hour and a half from Los Angeles and Orange County. The area consists of three separate mountains (Mountain High East, West, and North), and offers a wide variety of lifts and trails, a world-class terrain park, an outstanding Winter Sports School, and the region’s largest tubing area. Night skiing & snowboarding is available most evenings until 10pm and snowmaking covers more than 80% of the slopes. Mountain High has been the first resort to open in Southern California for the past 14 years and traditionally operates from mid November to mid April. Get more at mthigh.com.